Recap of the main event from Fastlane. Michael Cole introduces a video that was posted on Facebook earlier in the day. Brock Lesnar attacked Dean Ambrose as he arrived at the venue. Ambrose was taken away in an ambulance. Vince McMahon heads to the ring to present the Vincent J. McMahon Legacy of Excellence award. He talks about the McMahon family history. He then presents the award to Stephanie. She kind of almost cries a little. As she begins her speech, Shane McMahon comes out! Shane says the award is a good idea, but Stephanie isn’t a worthy recipient. He lists things like injuries, ratings, and stocks as indicators that she is failing at running the WWE. He also says that he might have been away, but he didn’t lose his place in line. Shane says he wants the WWE to succeed, and he wants control of RAW. Vince agrees, but on the condition that he has to wrestle and win a match. Shane agrees. Vince makes a match for Wrestlemania: Shane McMahon vs The Undertaker. Hell in a Cell. ** Seeing Shane come out was one of those rare, amazing moments. I actually got it spoiled before I saw it, but I still got goosebumps. Very good match. It started out like a typically good New Day match but it got even better as it went along. Towards the later part of the match it started to break down and everyone involved started pulling off moves we don’t see them do very often. Maybe the best sequence was when Neville did a 450 off the apron onto Big E on the floor, then Kalisto did a springboard off of Neville and hit a 450 onto Woods on the floor. Everyone looked very good. This was definitely one of the better six man tag matches I’ve seen in a while. Jojo asks Reigns how Ambrose is doing. Reigns hasn’t gotten any info. He’s also focused on Wrestlemania. Paul Heyman talks about how Dean Ambrose turned the triple threat match at Fastlane into a street fight and how it pissed off Brock Lesnar. Lesnar got some revenge by attacking Ambrose in the parking lot. No shield can protect Ambrose from the wrath of Lesnar. Heyman warns everyone in the locker room about Lesnar’s upcoming path of destruction. An ambulance pulls up next to the stage with its siren blaring. Ambrose, in a neck brace, is driving. Ambrose stumbles towards the ring. He can’t stand up. Brock steps on Ambrose’s head as he walks past him and up the ramp. Heyman drops his mic on Ambrose. Ambrose gets on the mic and challenges Lesnar to a street fight at Wrestlemania. Lesnar answers by giving Ambrose an F5. Heyman translates: Lesnar accepts. The Usos come out for a match. Before the bell rings, the Dudley Boyz come out onto the stage and remind everyone that they aren’t a nostalgia act. They will be defined by their accomplishments and not a piece of furniture. D-Von tells the Usos that their father should have taught them respect. It was short, and it wasn’t flashy, but it was an okay match. It served its purpose of showing everyone that the Usos are angry. The Ascension attacked the Usos from behind to start the match, but everything from there on out was completely one-sided. Chris Jericho comes out and politely calls out AJ Styles. Jericho congratulates Styles for proving that he belongs in the WWE and that he’s phenomenal. As they shake hands the Social Outcasts come out. Bo Dallas’ heart is warmed by the love in the ring. Curtis Axel makes fun of respect and handshakes. Slater calls Styles a coward. Rose says that no one is buying Y2AJ. Slater tells them they need to leave the ring. Jericho says they weren’t planning on it, but maybe he and Styles should be a team. Good match. It was fairly short, but it was fun to see Jericho and Styles team up again, this time working as a team rather than two guys trying to outdo each other. Triple H tells Stephanie to “let it go.” Stephanie won’t let it go. Triple H calms her down by saying that the night started poorly, but it will end well. Stephanie informs Reigns that he has a match against Sheamus tonight and insinuates the League of Nations might try to injure him. Goldust made a cake for R-Truth to apologize for costing him his match against Axel at Fastlane. R-Truth doesn’t want to forgive Goldust. He smashes the cake in Goldust’s face. This was an okay match. This is apparently a start of a heel turn for Ryback, but I don’t think the turn was done very well. Ryback just left the apron and walked away from the ring, but his team wasn’t really even in trouble at the time. Kane was in control and closing in on a possible win when Ryback decided to leave. It doesn’t make a lot of sense, or at the very least it wasn’t terribly effective. The match itself was a bit like the Fastlane match, a little slow though there were some pretty good moments. Rich Brennan asks Ryback why he left the ring. Ryback says he won last night and has nothing to prove. He’s done with tag matches and the spotlight should be on him. Short but good. They managed to put a decent amount of action into the time they were given. Becky Lynch came out to even the odds after Tamina caused a distraction. After the match, Charlotte comes out and insults Sasha and Becky. She informs them that they will be facing each other in a match to determine who will face Charlotte for the title at Wrestlemania. She pointlessly points out how Becky and Sasha aren’t good friends. ** Charlotte’s manner of speaking annoys me. I think I’ve said this before, but it feels like she’s trying to emulate her father way too much. All of her statements are very slow and deliberate. Anyway. Stephanie refuses to work for Shane. Vince explains that he’s brilliant and manipulated Shane into creating another main event for Wrestlemania. Michael Cole and JBL reveal that The Godfather is the second Hall of Fame inductee this year. So we get Sheamus versus Reigns again, huh? This was pretty much the same as any other Reigns/Sheamus match, only it happened again. It seemed like filler. Stephanie’s warning earlier in the night meant absolutely nothing. The League was thrown out during the commercial break after doing nothing. Stephanie also said that Sheamus didn’t want to be forgotten on the road to Wrestlemania, but he was even forgotten during this segment. He just kind of disappeared when Triple H came out. Needless to say, not a great match. There wasn’t even really a point to it besides to get Reigns out to the ring. Triple H comes out. He and Reigns hit each other. Triple H repeatedly smashes Reigns’ head into the announce table, bloodying him. He continues to punch Reigns in the nose until officials come out to hold him back. Triple H continues the attack, pedigreeing Reigns on the steel ring steps. This was mostly a good show. Shane McMahon coming back is going to be a classic moment. The setup (the Legacy award) was contrived the the point of absurdity, but it was worth it for the payoff. I also like that they set up a number of Wrestlemania matches on this show. I think the show is shaping up to be interesting despite my personal preferences not really being met. I think the Triple H attack at the end certainly helps the title match, but I’m still not thrilled with it. 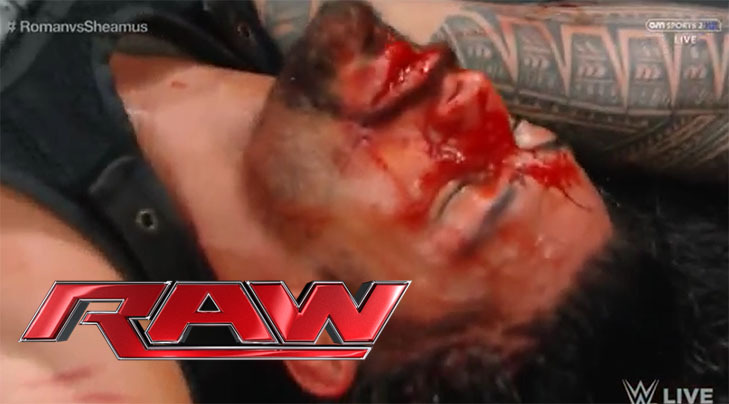 I did think it was interesting that they allowed Reigns to bleed a lot on TV and even shot closeups, but blood by itself doesn’t make a feud interesting. Still, it was a pretty memorable moment. This show had a few very memorable moments. This was a great, very fun match and is definitely one that I’ll watch again. I can’t say that for any other match on the show. Really, all the other matches were storyline driven and the matches themselves seemed secondary to that.